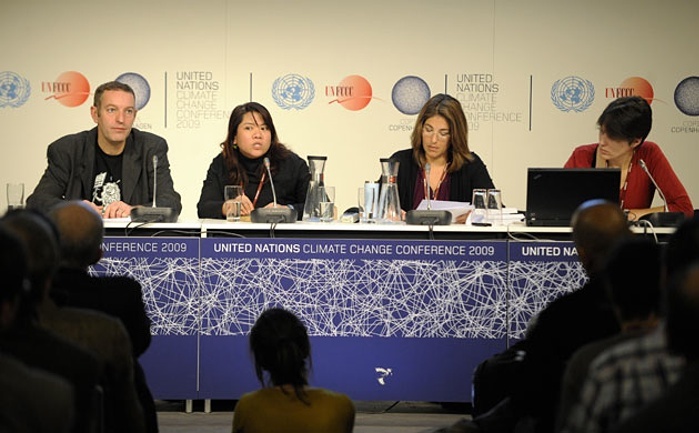 (From L) Paul de Clerck (Friends of the Earth International), Dorothy Guerrero (Focus on the Global South) and Naomi Klein announces the winner of the Angry Mermaid award on December 15, 2009 at COP15. Monsanto received 37% of the votes ahead of Royal Dutch Shell 18% and the American Petroleum Institute 14%. On the occasion of its ten-year anniversary, the antiglobalization movement has been brought out of its slumber. This is to be expected, as anniversaries and nostalgia often trump the here and now in political action. What is troublesome, though, is not the celebration of a historical moment but the attempted resurrection of this movement, known by some as the Global Justice Movement, under the banner of Climate Justice. If only regenerating the zeitgeist of a radical moment was as simple as substituting ‘Climate’ for ‘Global’; if only movements appeared with such eas! In fact, this strategy, pursued to its fullest extent in Copenhagen during the UN COP15 Climate Change Summit, is proving more damaging than useful to those of us who are, and have been for the past decade, actively antagonistic to capitalism and its overarching global structures. Here, we will attempt to illustrate some of the problematic aspects of the troubled rebranding of a praxis particular to a decade past. Namely, we will address the following: the financialization of nature and the indirect reliance on markets and monetary solutions as catalysts for structural change, the obfuscation of internal class antagonisms within states of the Global South in favor of simplistic North-South dichotomies, and the pacification of militant action resulting from an alliance forged with transnational NGOs and reformist environmental groups who have been given minimal access to the halls of power in exchange for their successful policing of the movement. Many of these problematic aspects of the movement’s rebranding became apparent in Copenhagen during the main, high-profile intellectual event that was organized by Climate Justice Action (CJA) on December 14 . CJA is a new alliance formed among (but of course not limited to) some of the Climate Camp activists from the UK, parts of the Interventionist Left from Germany, non-violent civil disobedience activists from the US and the Negrist Disobbedienti from Italy. The event, which took place in the “freetown” of Christiania, consisted of the usual suspects: Naomi Klein, Michael Hardt, and CJA spokesperson Tadzio Mueller, and it was MCed by non-violent activist guru Lisa Fithian. In their shared political analysis, all of the speakers emphasized the rebirth of the anti-globalization movement. But an uncomfortable contradiction was overarching: while the speakers sought to underscore the continuity with the decade past, they also presented this summit as different, in that those who came to protest were to be one with a summit of world nations and accredited NGOs, instead of presenting a radical critique and alternative force. Let’s look at this contemporary notion of debt, highlighted by Naomi Klein as the principal avenue of struggle for the emerging climate justice movement. A decade ago, the issue of debt incurred through loans taken out from the IMF and World Bank was an integral part of the antiglobalization movement’s analysis and demand to “Drop the Debt.” Now, some of that era’s more prominent organizers and thinkers are presenting something deemed analogous and termed ‘climate debt’. The claim is simple: most of the greenhouse gases have historically been produced by wealthier industrial nations and since those in the Global South will feel most of its devastating environmental effects, those countries that created the problem owe the latter some amount of monetary reparations. The idea of climate debt, however, poses two large problems. First, while “Drop the Debt!” was one of the slogans of the antiglobalization movement, the analysis behind it was much more developed. Within the movement everyone recognized debt as a tool of capital for implementing neoliberal structural adjustment programs. Under pressure from piling debt, governments were forced to accept privatization programs and severe austerity regimes that further exposed local economies to the ravages of transnational capital. The idea was that by eliminating this debt, one would not only stop privatization (or at least its primary enabling mechanism) but also open up political space for local social movements to take advantage of. Yet something serious is overlooked in this rhetorical transfer of the concept of debt from the era of globalization to that of climate change. Contemporary demands for reparations justified by the notion of climate debt open a dangerous door to increased green capitalist investment in the Global South. This stands in contrast to the antiglobalization movement’s attempts to limit transnational capital’s advances in these same areas of the world through the elimination of neoliberal debt. The recent emergence of a highly lucrative market formed around climate, and around carbon in particular cannot be overlooked when we attempt to understand the implications of climate reparations demands. While carbon exchanges are the most blatant form of this emerging green capitalist paradigm, value is being reassigned within many existing commodity markets based on their supposed impact on the climate. Everything from energy to agriculture, from cleaning products to electronics, and especially everything within the biosphere, is being incorporated into this regime of climate markets. One can only imagine the immense possibilities for speculation and financialization in these markets as the green bubble continues to grow. The foreign aid and investment (i.e. development) that will flow into countries of the Global South as a result of climate debt reparations will have the effect of directly subsidizing those who seek to profit off of and monopolize these emerging climate markets. At the Klimaforum, the alternative forum designed to counter the UN summit, numerous panels presented the material effects that would result from a COP15 agreement. In one session on climate change and agricultural policies in Africa, members of the Africa Biodiversity Network outlined how governments on the continent were enclosing communally owned land, labeling it marginal and selling it to companies under Clean Development Mechanisms (CDMs) for biofuel cultivation. CDMs were one of the Kyoto Protocol’s arrangements for attracting foreign investment into the Global South under the guise of reducing global greenhouse gas emissions. These sorts of green capitalist projects will continue to proliferate across the globe in conjunction with aid given under the logic of climate debt and will help to initiate a new round of capitalist development and accumulation, displacing more people in the Global South and leading to detrimental impacts on ecosystems worldwide. The concept that those in the streets outside of the summit are supposed to be part of the same political force as the NGOs and governments who have been given a seat at the table of summit negotiations was the main determining factor for the tenor of the actions in Copenhagen. The bureaucratization of the antiglobalization movement (or its remnants), with the increased involvement from NGOs and governments, has been a process that manifested itself in World Social Forums and Make Poverty History rallies. Yet in Copenhagen, NGOs were much more than a distracting sideshow. They formed a constricting force that blunted militant action and softened radical analysis through paternalism and assumed representation of whole continents. In Copenhagen, the movement was asked by these newly empowered managers of popular resistance to focus solely on supporting actors within the UN framework, primarily leaders of the Global South and NGOs, against others participating in the summit, mainly countries of the Global North. Nothing summarizes this orientation better than the embarrassingly disempowering Greenpeace slogans “Blah Blah Blah, Act Now!” and “Leaders Act!” Addressing politicians rather than ordinary people, the attitude embodied in these slogans is one of relegating the respectable force of almost 100,000 protesters to the role of merely nudging politicians to act in the desired direction, rather than encouraging people to act themselves. This is the logic of lobbying. No display of autonomous, revolutionary potential. Instead, the emphasis is on a mass display of obedient petitioning. One could have just filled out Greenpeace membership forms at home to the same effect. A big impetus in forging an alliance with NGOs lay in the activists’ undoubtedly genuine desire to be in solidarity with the Global South. But the unfortunate outcome is that a whole hemisphere has been equated with a handful of NGO bureaucrats and allied government leaders who do not necessarily have the same interests as the members of the underclasses in the countries that they claim to represent. In meeting after meeting in Copenhagen where actions were to be planned around the COP15 summit, the presence of NGOs who work in the Global South was equated with the presence of the whole of the Global South itself. Even more disturbing was the fact that most of this rhetoric was advanced by white activists speaking for NGOs, which they posed as speaking on behalf of the Global South. Klein is correct in this respect: Copenhagen really was nothing like Seattle. The most promising elements of the praxis presented by the antiglobalization movement emphasized the internal class antagonisms within all nation-states and the necessity of building militant resistance to local capitalist elites worldwide. Institutions such as the WTO and trade agreements such as NAFTA were understood as parts of a transnational scheme aimed at freeing local elites and financial capital from the confines of specific nation-states so as to enable a more thorough pillaging of workers and ecosystems across the globe. Ten years ago, resistance to transnational capital went hand in hand with resistance to corrupt governments North and South that were enabling the process of neoliberal globalization. Its important to note that critical voices such as Evo Morales have been added to the chorus of world leaders since then. However, the movement’s current focus on climate negotiations facilitated by the UN is missing a nuanced global class analysis. It instead falls back on a simplistic North-South dichotomy that mistakes working with state and NGO bureaucrats from the Global South for real solidarity with grassroots social movements struggling in the most exploited and oppressed areas of the world. Aligning the movement with those working inside the COP15 summit not only had an effect on the politics in the streets but also a serious effect on the tactics of the actions. The relationship of the movement to the summit was one of the main points of discussion about a year ago while Climate Justice Action was being formed. NGOs who were part of the COP15 process argued against taking an oppositional stance towards the summit in its entirety, therefore disqualifying a strategy such as a full shutdown of the summit. The so-called inside/outside strategy arose from this process, and the main action, where people from the inside and the outside would meet in a parking lot outside of the summit for an alternative People’s Assembly, was planned to highlight the supposed political unity of those participating in the COP15 process and those who manifested a radical presence in the streets. Having made promises to delegates inside the Bella Center on behalf of the movement, Naomi Klein asserted that “Anybody who escalates is not with us,” clearly indicating her allegiances. Rather than reentering the debate about the validity of ‘escalating’ tactics in general, arguing whether or not they are appropriate for this situation in particular, or attempting to figure out a way in which different tactics can operate in concert, the movement in Copenhagen was presented with oppressive paternalism disguised as a tactical preference for non-violence. The antiglobalization movement attempted to surpass the eternal and dichotomizing debate about violence vs. non-violence by recognizing the validity of a diversity of tactics. But in Copenhagen, a move was made on the part of representatives from Climate Justice Action to shut down any discussion of militant tactics, using the excuse of the presence of people (conflated with NGOs) from the Global South. Demonstrators were told that any escalation would put these people in danger and possibly have them banned from traveling back to Europe in the future. With any discussion of confrontational and militant resistance successfully marginalized, the thousands of protesters who arrived in Copenhagen were left with demonstrations dictated by the needs and desires of those participating in and corroborating the summit. Alongside the accreditation lines that stretched around the summit, UN banners proclaimed “Raise Your Voice,” signifying an invitation to participate for those willing to submit to the logic of NGO representation. As we continue to question the significance of NGO involvement and their belief that they are able to influence global decision-making processes, such as the COP15 summit, we must emphasize that these so-called participatory processes are in fact ones of recuperative pacification. In Copenhagen, like never before, this pacification was not only confined to the summit but was successfully extended outward into the demonstrations via movement leaders aligned with NGOs and governments given a seat at the table of negotiations. Those who came to pose a radical alternative to the COP15 in the streets found their energy hijacked by a logic that prioritized attempts to influence the failing summit, leaving street actions uninspired, muffled and constantly waiting for the promised breakthroughs inside the Bella Center that never materialized. NGO anger mounted when a secondary pass was implemented to enter the summit during the finalfour days, when presidents and prime ministers were due to arrive. Lost in confusion, those demonstrating on the outside were first told that their role was to assist the NGOs on the inside and then were told that they were there to combat the exclusion of the NGOs from the summit. This demand not to be excluded from the summit became the focal politic of the CJA action on December 16. Although termed Reclaim Power, this action actually reinforced the summit, demanding “voices of the excluded to be heard.” This demand contradicted the fact that a great section of the Bella Center actually resembled an NGO Green Fair for the majority of the summit. It is clear that exclusionary participation is a structural part of the UN process and while a handful of NGOs were “kicked out” of the summit after signing on to Reclaim Power, NGO participation was primarily limited due to the simple fact that three times as many delegates were registered than the Bella Center could accommodate. In the end, the display of inside/outside unity that the main action on the 16th attempted to manifest was a complete failure and never materialized. The insistence on strict non-violence prevented any successful attempt on the perimeter fence from the outside while on the inside the majority of the NGO representatives who had planned on joining the People’s Assembly were quickly dissuaded by the threat of arrest. The oppressive insistence by CJA leaders that all energy must be devoted to supporting those on the inside who could successfully influence the outcome of the summit resulted in little to no gains as the talks sputtered into irreconcilable antagonisms and no legally binding agreement at the summit’s close. An important opportunity to launch a militant movement with the potential to challenge the very foundations of global ecological collapse was successfully undermined leaving many demoralized and confused. As we grapple with these many disturbing trends that have arisen as primary tendencies defining the climate justice movement, we have no intention of further fetishizing the antiglobalization movement and glossing over its many shortcomings. Many of the tendencies we critique here were also apparent at that time. What is important to take away from comparisons between these two historical moments is that those in leadership positions within the contemporary movement that manifested in Copenhagen have learned all the wrong lessons from the past. They have discarded the most promising elements of the antiglobalization struggles: the total rejection of all market and commodity-based solutions, the focus on building grassroots resistance to the capitalist elites of all nation-states, and an understanding that diversity of tactics is a strength of our movements that needs to be encouraged. The problematic tendencies outlined above led to a disempowering and ineffective mobilization in Copenhagen.Looking back, it is clear that those of us who traveled to the Copenhagen protests made great analytical and tactical mistakes. If climate change and global ecological collapse are indeed the largest threats facing our world today, then the most important front in this struggle must be against green capitalism. Attempting to influence the impotent and stumbling UN COP15 negotiations is a dead end and waste of energy when capital is quickly reorganizing to take advantage of the ‘green revolution’ and use it as a means of sustaining profits and solidifying its hegemony into the future. Instead of focusing on the clearly bankrupt and stumbling summit happening at the Bella Center, we should have confronted the hyper-green capitalism of Hopenhagen, the massive effort of companies such as Siemens, Coca-Cola, Toyota and Vattenfall to greenwash their image and the other representations of this market ideology within the city center. In the future, our focus must be on destroying this reorganized and rebranded form of capitalism that is successfully manipulating concerns over climate change to continue its uninterrupted exploitation of people and the planet for the sake of accumulation. At our next rendezvous we also need to seriously consider if the NGO/non-profit industrial complex has become a hindrance rather than a contribution to our efforts and thus a parasite that must be neutralized before it can undermine future resistance.